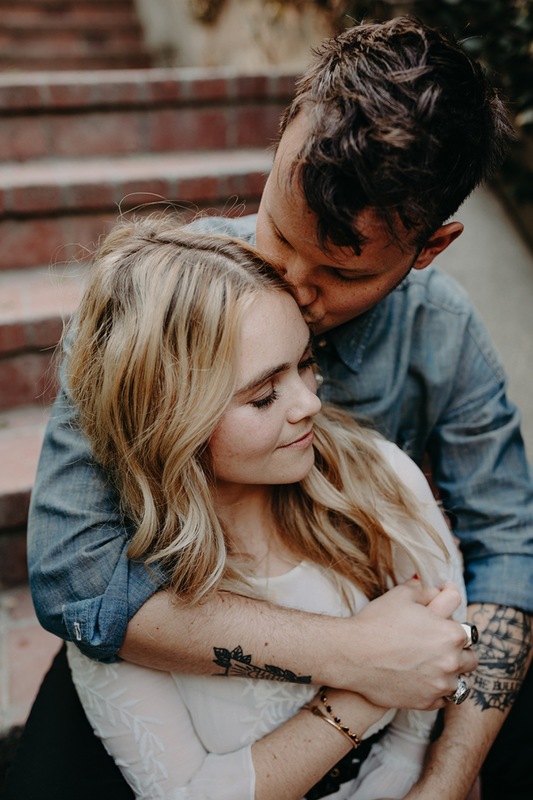 Having a home in Hollywood gave Hanna and Brian a familiar space to host their engagement session that's truest to their love. Shooting where a couple lives is such an intimate, emotional experience--this is where they've made their life together, where their marriage will exist through time. The surrounding details are just as reminiscent of their connection, expressing it just as elegantly as the soft way they look to each other, smiling. This artwork, these plants, those records, have felt their hands, their passion. These things have witnessed who they are as one. In every image, it's evident that their adoration as well as their style is tender, effortless and warm. Their hearts are so full. And it extends to anyone sharing their walls or their story. I felt such a delicate energy from these two, something that touches me even still. I remember it, how he held her neck in the window light, how he made her laugh. The way she kissed him back as if I wasn't there. As if this were a memory they were making alone, away from the rest of the world, lost in their own sweet devotion. I felt so lucky to be a part of that, like the antique mirror, the chandelier, the kitchen table--something that knows them as they have been and will be. And their wedding will take place in a private residence as well. Somewhere personal that reflects their closeness. She will stare into his eyes as she did here, they will dance to their song the same way they twirled in their own living room. It will be as beautiful as their love is, as their life is--romantic, ornate, and gentle. I can't wait for it. H & B, you guys are a dream!